Whoever we are and however we seek peace, solace or a connection with something beyond the mundane, for the majority of us there is a place where we find something that refreshes our soul, or at least feels closer to doing so than the highways and byways of our everyday life. The spiritually developed person who sees the divine in everything will still regularly be drawn to a certain garden or hilltop. Even the Buddha, refined through many lifetimes to have no attachment to things in the physical world, chose a specific sacred fig tree under which to sit and meditate his way to enlightenment. Some places just have something about them that resonates with us in a way that other places do not. In an animist culture the assumption would be that a being of some sort lived there, a spirit or spirits specific to that place. If the spirit was friendly and the place popular the spirit might be credited with influence beyond their personal rock, dell or circle of trees, often involving the well-being of plants and animals in the general vicinity. It seems to me that a good number of the fairy folk started life as spirits of place, particularly the diminutive winged types found in sylvan glades who are clearly connected to the fertility of the forest. Thus they do not posses the power of invisibility, it is their natural state. The power they posses is that of visibility, allowing themselves to be seen by those who are open to their existence. The link between the small woodland fairies and their human sized namesakes comes about because the Tuatha De Danann and others of their ilk can also be considered as spirits of place. Connected with the hill forts, stone circles or hills they occupied while present in this world or the burial mounds they retreated in to, the large and powerful fairies are a mix of gods and ancestral spirits who attained a wide enough sphere of influence to become autonomous from their place of origin. It is easy to see how a smith of great skill in the early days of metalwork might be buried with great honour in a barrow., then, in a culture where ancestors were revered and their soul contacted and consulted, they would maintain their importance long after their physical presence had moved on. Though connected at a theoretical level it is still strange that these two kinds of being, with very different appearances and behaviours should share a name and even be found together according to many eye witness reports. My personal opinion is that the small fairies tag along with their larger brethren in much the same way that jackdaws hang around with rooks. If you want these denizens of the Otherworld to show themselves to you then there are obvious places to start. The good folk are fond of trees and especially thorns. Anywhere with the combination of oak, ash and thorn is likely. Of course, fairy rings indicate a favoured dancing spot and any barrow, burial mound or particularly well rounded hill should be worth a look. The best place however, may be just that place you go to yourself that has something indefinable about it that makes you happy, for the fairies who live there already know you. I don’t use the term “fairytale” very often. It is odd that somehow the title “fairytale” has become a blanket term for any story involving magic. For me it is only a fairytale if it actually has a fairy in it. So how do we identify a fairy? Oh, Now we have entered a realm of confusion! I have several books purporting to be specifically about fairies (or faeries, we can’t even reach consensus on the spelling). These contain descriptions and tales of the wee folk by the various names of Spriggans, Pixies, Piskies, Sidhe (pronounced “shee”), Good Folk (I could go on but we’ve barely scratched the surface and haven’t even left the British Isles), but also feature Trow, Trolls, Koboldoi, Gnomes, Brownies, Nixen, Knockers and a host of other supernatural beings. It’s a bit like buying a textbook on humans and finding chapters on marmosets and grizzlies. Let’s start at the beginning. The Irish Book Of Invasions tells us that at one time the land of Éire was in possession of the tall, fair skinned Tuatha De Danann. Long lived and wielding powerful magic the Tuatha De held truth and fairness in high esteem and many stories are told of their time. Then the Milesians, whose descendants are the current Irish, turned up, fought the Tuatha De for the land, won, and banished the Tuatha De Danann in to the ancient burial mounds that litter the country where they still live as the Sidhe or faery host. Since their banishment the Fair Folk have interacted with humans in a variety of ways. Women and men from each race have fallen in love with, seduced or abducted and married someone from the other; items have been stolen by each from each and favours, trades and deals have been done leading to both lasting happiness and deep sorrow. One of the oddest things about The Ever Living Ones is that they appear to be shrinking. The Tuatha De were considered tall against humans. A few hundred years ago elves were generally perceived as around three or four feet tall. The modern apprehension of the size of a fairy is probably between ten and twenty centimetres. What they have lost in stature they have made up in utility, having apparently grown wings along the way. However, just incase you thought you were getting a handle on them, some can switch from small to large if they wish. Probably the most consistent thing about fairies is that they are attractive to human senses: they are beautiful to gaze upon, their music and voices are sweet to the ear and the smell of their food ravishing to the nostrils. Whether short or tall, a glimpse of the Good Folk fills the mortal observer with wonder, delight and curiosity, but beware, they are very choosy about the humans they will share their wonders with and many who have blundered excitedly in to the revels of the Fae have suffered for it afterwards. 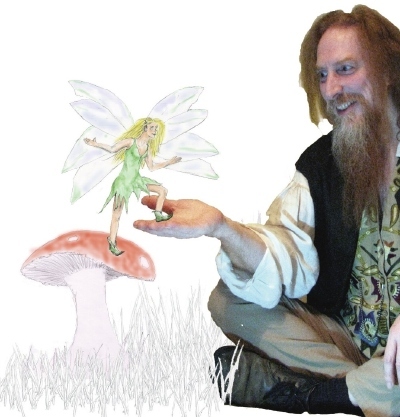 Now it seems your humble Talesman has fallen under their spell, for my spring tour will be “Away With The Fairies” and I shall be reading everything I can about them over the next three months, so no doubt you will hear a little more about them too.